Yâqût al-Hamawî was a Syrian biographer and geographer known for his encyclopaedia writings of the Muslim world. His Mujam al-Buldan, a geographical dictionary that includes much biographical, historical, and cultural data, is a primary source in Arabic scholarship, covering the history, ethnography, and myths related to the places. Yaqut ibn-'Abdullah al-Rumi al-Hamawi (1179 - 1229) was born a Greek in Asia Minor; captured in war and enslaved; but the Baghdad merchant who bought him gave him a good education, and then freed him . The merchant in fact engaged Yāqūt as his secretary and sent him on commercial tours on Qeys island, which was one of the main storehouses between India and Europe . Yāqūt, then, left the services of the merchant, to turn to scholarly activities, copying and selling manuscripts, whilst studying Arabic and grammar . He failed to make a living, and returned to the services of his former master and trading activities, until his ex-master's death, following which, Yāqūt settled in Baghdad as a book seller . Yāqūt could not settle in one place though, and travelled much, first as a merchant, then as a geographer fascinated by places and their diverse populations, dress, and ways . He reached Merv, where he stayed for two years. What attracted him there, were the libraries; ten wealthy libraries, two in the chief mosque and the remainder in the madrassas . In the chief mosque, he says, there were up to 12,000 books collected . He stayed there, collecting and studying the books in the large library, the discriminating curators allowed him to take as many as 200 volumes at a time to his room . Those who have loved books as the lifeblood of great men will sense the dusty joy he felt in these treasuries of the mind . In 1218, he moved on to Khiva and Balkh; but it was the wrong time. Figure 1. Areas of Yāqūt's geographical travels and descriptions. Early in the 1220s, the Mongols, from their eastern kingdoms, went on the move west. The whole of eastern Islam was devastated. In just one year the Mongols seized the most populous and the best cultivated parts, whose inhabitants excelled in character and urbanism, and devastated them. 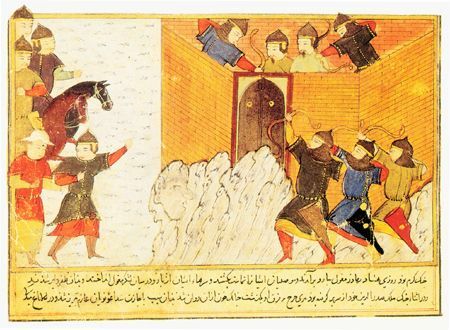 An army under Jenghiz's son Jagtai, captured and sacked Otrar, whilst another under Jenghiz himself, attacked Bukhara, Samarkand and Balkh and marched towards Khurasan. Merv and Nishapur were captured . Yāqūt, himself, was nearly caught, on one occasion, he fled, wearing no clothes, but clutching his manuscripts, across Persia to Mosul . From Mosul, he went back to Aleppo, where he remained under the patronage of Al-Qifti, until his death in 1229. During such stay, he still managed to make trips to Palestine, Egypt, Iraq and other parts . Whilst working as a book-seller, Yāqūt also worked as an author. Only four of his many works have survived time, though; best known being his Mu'ajam al-Udaba (Dictionary of the learned men); and Mu'ajam al-Buldan (Dictionary of countries). These two works, altogether, were 33 180 pages long . Figure 2. Yāqūt's Arabic text of Mu'jam al-Buldan (Abu Dhabi, 2002). Mu'jam al-Buldan is a vast geographical encyclopaedia which summed up nearly all medieval knowledge of the globe. Yāqūt included almost everything from archaeology, ethnography, history, anthropology, natural sciences, geography, giving coordinates for every place, etc . For every town and city, he gave ever name, described every part with its monuments and wealth, its history, its population, and its leading figures. To obtain information, Yāqūt travelled to Persia, Arabia, Iraq and Egypt, and whilst established in Aleppo, (Syria), he built relations and friendships with scientists and historians. He also befriended al-Qifti, then minister, to whom he dedicated his dictionary. Yāqūt's dictionary of countries is not just a collection of facts from other historians, geographers and travellers, he also adds, and more importantly, facts gleaned from his many long travels experience, and from people he met during such travels . That Yāqūt was fully conversant with the various concepts of Muslim geographers relating to mathematics, physical, and regional geography, is well documented in his introduction, which also includes discussions of the geographical and legal terms in the work . Yāqūt also used works that came before him, and did not fail to correct them whenever it was judged necessary. Throughout, his work and sources submit to strict observation, and all that was unchecked by facts was removed. Yāqūt insists on the accuracy and rigour of his information . Mu'jam al-Buldan, thus remains to our day, as Miquel notes, an excellent source for reference . In his Dictionary of Countries, Yāqūt sees the intricate relation which exists between geography and history, and emphasised the role of orthography of place names . Arranged in alphabetical order, too, the Dictionary attempts to give the exact spelling of place names, their geographical positions, boundaries, mountains, and deserts, seas and islands. Yāqūt also gives for each place the names of eminent natives, including anecdotes and interesting facts. He notes that ancient writers in particular had not given enough attention to precise spelling, and precise location of places, which often misled scholars and men of letters . The inspiration to produce a geographical dictionary that would serve as a travel guide to Muslims, however, came from the teachings of Quran and other religious works . Yāqūt believed that such a work was essential not only for the traveller, but also for the jurist, the theologian, the historian, the physician, and the savant . "The man of letters selects the choicest from everything and then composes it, while a scholar selects a particular branch of knowledge and improves upon it ." For Yāqūt, the science of akhbār (usages) was the fountainhead of all knowledge and wisdom, and was superior to all other sciences. Quoting Ali Ibn al-Hasan, who quoted earlier writers on the subject, Yāqūt says that if scholars had not concerned themselves with akhbār and with the works of āthār (traces or narratives), the beginning of knowledge would have become corrupt and its ends would have perished . With these precepts in mind, Yāqūt completed his Dictionary of the learned men, which covers the lives of men of letters, grammarians, linguists, genealogists, famous readers of the Quran, historians, and secretaries, which covers most information on men of letters. The work is more or less in alphabetical order . "Sir, I am a created being, and created beings need audacity (as a safety valve, to give vent to their feelings), or they would die from suffocation. Therefore, with your permission, may I ask a question?" "I understand that you are going to ask a very difficult question. So go on, and tell me what you have in mind." "Why are you called Sumaym…?" Ever since its publication, for more than seven centuries, Yāqūt's works have served as a mine of information for scholars both in the Islamic world and also those outside, including those in the West today . In his Mu'ajam al-udaba, Yāqūt tells this story, that Caliph al-Mutamid went for a walk one day in his garden, and taking Thabit Ibn Qurra by the hand, he abruptly dropped it. "What is the matter, Oh Emir of the faithful ? ", asked Thabit. "My hand, answered the Caliph, was above yours; but science is higher ." Figure 4. 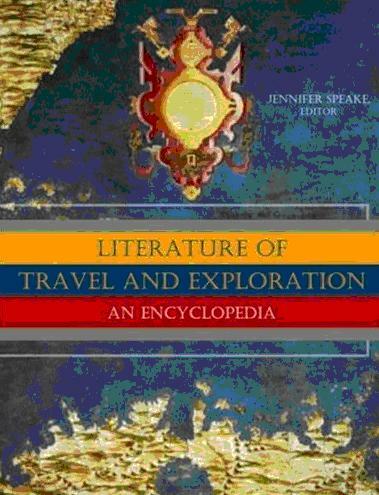 Cover of Literature of Travel and Exploration: An Encyclopedia, edited by Jennifer Speake (London: Routledge, 2003) where an entry is devoted to Yaqut by Marina Tolmachëva. "An unfortunate feeling of superiority also often distorts Western opinion concerning Muslim scholarship. It is strange, for instance, to hear a European scholar state in connection with Yāqūt's rejection of the story of the Magic Horseman in Baghdad that ?it is seldom that Yāqūt shows so much common sense, ' when, nothwistanding his merits, this scholar is dwarfed into insignificance by Yāqūt ." Ahmad, S. M., "Yaqut al-Hamawi", Dictionary of Scientific Biography. New York: Charles Scribener's Sons, vol. 14. Browne, Edward Granville, Literary History of Persia, 4 vols. Cambridge: Cambridge University Press, vol. 2, 1929. First edit. 1902-24. Jwaideh, Wadie, The Introductory Chapters of Yaqût's ‘Mu'jam al-buldân'. Leiden: Brill, 1959. Margoliouth, D. S., Yaqut's Dictionary of Learned Men, edited by D. S. Margoliouth. London: Luzac, 1907 ff. Miquel, André, "Geography", Encyclopaedia of the History of Arabic Science, edited by R. Rashed. London: Routledge, 1996, pp. 796-812. F.R. Rosenthal, The Technique and Approach to Muslim Scholarship. Roma: Pontificum institutum Biblicum, 1947. Wustenfeld, Ferdinand, Jacut's geograpisches Wörterbuch. Leipzig: F. A. Brockhaus, 6 vols., 1866-73. W. Durant, The Age of faith, New York: Simon and Shuster, 6th printing, 1950, p. 329. Barron Carra de Vaux: Les Penseurs de l'Islam; Geuthner, Paris, 1921; op cit; p. 15. S. M. Ahmad, "Yaqut al-Hamawi", Dictionary of Scientific Biography, New York: Charles Scribener's Sons, vol. 14, p. 546. S.M. Ahmad, "Yaqut", p. 546. W. Durant, The Age of Faith, op. cit., p. 329. In J. Pedersen, The Arabic Book (1928), trans by G French; Princeton, NJ. : Princeton University Press, 1984, p. 128. Barron Carra de Vaux, Les Penseurs, op. cit., p. 15. In J. Pedersen, The Arabic Book, op. cit., p. 128. See on the Mongol invasions of the Muslim East B. Spuler, History of the Mongols, London: Routledge & Kegan Paul, 1972, p. 31; W. Durant, The Age of Faith, op. cit., p. 339; and E.G. Browne, Literary History of Persia, Cambridge University Press, vol. 2, 1929, p. 439. S. M. Ahmed, "Yaqut", op. cit., p. 547. Yāqūt Ibn ‘Abd Allāh al-Hamawī, Irshād al-Arīb ilā Ma'rifat al-Adīb, also referred to as Mu'jam al-Udabā'. Dictionary of Learned Men, edited by D. S. Margoliouth, London: Luzac, 1907 ff. ; Jacut's Geographisches Worterbuch, ed. F. Wustenfeld, 6 vols., Leipzig, 1866-70. W. Durant, The Age, op. cit., p. 329. W. Jwaideh, The Introductory Chapters of Yaqut's Mu'ajam al-Buldan, Leiden, 1959, p. 19. C. Bouamrane et L. Gardet, Panorama de la pensée islamique, Paris: Sindbad, 1984, p.p 260. A.Miquel, "Geography", Encyclopaedia of the History of Arabic Science, edited by R. Rashed, London: Routledge, 1996, pp. 796-812; at p. 809. S. M.Ahmed, "Yaqut", op. cit., p. 547. W. Jwaideh, The Introductory Chapters, op. cit., pp. 3-4. D. Margoliouth, Dictionary of Learned Men, op. cit., pp. 1-17. D. Margoliouth, Dictionary of Learned Men, op. cit. Yaqut, Irshad, 5:129 ff; Margoliouth ed., 13:51 ff; F.R. Rosenthal, The Technique and Approach to Muslim Scholarship, Pontificum institutum Biblicum, Roma, 1947, pp. 48-50. S.M.Ahmed, "Yaqut", op. cit., p. 548. In Barron Carra de Vaux, Les Penseurs, op. cit., p. 78. G. Le Strange, Baghdad during the Abbasid Caliphate, Oxford, 1901; 1923; 31; n.1. F.R. Rosenthal, The Technique, op. cit., p. 4.